Home > Charities > Unwanted Christmas presents? The DoubleTree by Hilton would like them to benefit York charity! A York charity that supports people dependent on alcohol and drugs is hoping that staff and customers of a city hotel receive plenty of unwanted gifts this Christmas! 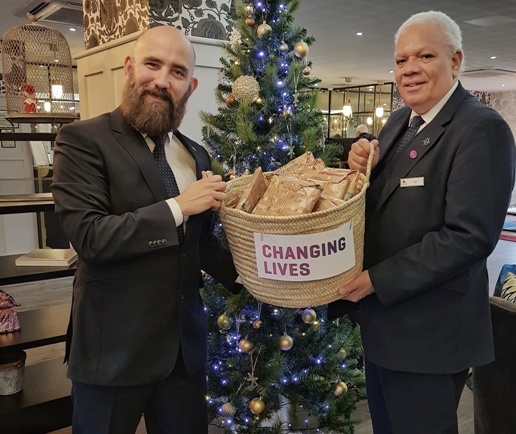 From Boxing Day, The DoubleTree by Hilton York is teaming up with Changing Lives, by being a collection for unwanted presents, which will be sold to help finance the charity’s work in the city. For more than 45 years, Changing Lives has been helping the most vulnerable and socially excluded in the North East, Yorkshire, the North West and the Midlands. Its dedicated drug and alcohol services offer tailored support to help people challenge their dependency. The DoubleTree by Hilton York’s sales and marketing director Nikki Brannan said: “Christmas is the time for giving and we are asking for staff, customers and York residents to consider giving us any unwanted presents. “These in turn will be passed on to the team at Changing Lives, on Walmgate, and will be used to help fund the ongoing work they do with people with drink and drug dependencies. “Since the formation of our CARES team just over a year ago, we are looking at helping a number of local, regional and national organisations who all operate within York and North Yorkshire. The DoubleTree by Hilton York is located at St Maurice’s Road, adjacent to Monk Bar.